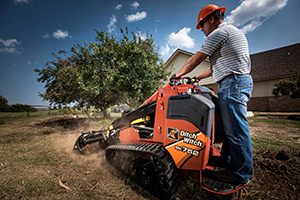 To help landscapers and renters stay comfortable and productive on any jobsite, the Ditch Witch SK752 mini skid-steer features an improved operator station with customer-driven control placement and exceptional ground clearance for better visibility. The machine’s rugged design leverages construction-grade components, delivering long-lasting performance on the toughest jobsites. The SK752 features an efficient, low-maintenance Kubota® diesel engine, providing exceptional power to the attachment for a wide range of utility, landscaping, plumbing and other underground construction tasks. For simple, secure connections, the machine is equipped with an advanced attachment latching system. For more productive loading, the SK752 features 860-pound (390-kg) rated operating capacity and an 83-inch (211-cm) hinge-pin height. An innovative high-drive track system has bolt-on sprockets and wide track rollers for longer track life, easier maintenance and greater stability.